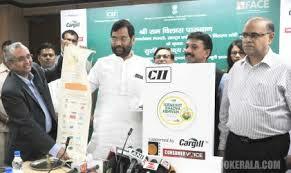 Shri Ram Vilas Paswan, Minister of Consumer Affairs, Food and Public Distribution launched the Surakshit Khadya Abhiyan, a countrywide campaign here today to create mass awareness and capacity building for safe and hygienic food. Launching the campaign, Shri Paswan said that the Surakshit Khadya Abhiyan initiative is extremely important and very relevant for all stakeholders, especially consumers. He said “food safety is an inseparable part of food security and no nation can guarantee food security if food in not completely safe. Food borne diseases which have severe health and economic consequences, both developed and developing countries can be prevented by food safety practices only”. Shri Paswan said that the initiative complements the widely popular multi-media campaign of his Ministry under the brand name of “Jago Grahak Jago” which empowers the consumers of its rights and demands. The campaign planned by CII and its partners including Consumer Organization VOICE, and National Association of Street Vendors of India (NASVI), is an effort towards building a culture of food safety in the country. Under the campaign, nationwide sensitisation sessions on cleaning, hygiene & sanitation for safe food, Walkathons and Media dissemination programmes for Consumers, Street Food Industries will be organized across the country. On the occasion the Minister launched a website and a logo of the campaign and also sign a pledge for a adopting safe food practices.